After a long hiatus from blogging, I'm back with a quick tutorial. 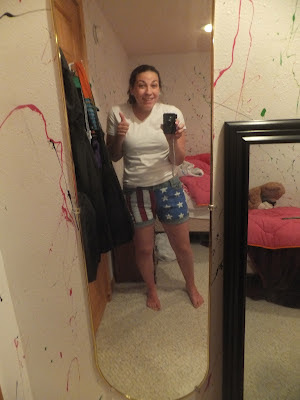 I made these shorts for the 4th of July and received quite a few compliments. Sure, the fireworks and independence day has passed, but they're still pretty fly shorts. Cheesy, mirror picture, but the only one I have of me actually wearing the shorts. This is pretty much exactly how I did mine, too!